In musical terminology, tempo (Italian for time, plural: tempi) is the speed or pace of a given piece. It is a crucial element of composition, as it can affect the mood and difficulty of a piece. The first two measures of Mozart's Sonata K. 331, which indicates the tempo as "Andante grazioso" and a modern editor's metronome marking: "♪ = 120". The tempo of a piece will typically be written at the start of a piece of music, and in modern music is usually indicated in beats per minute (BPM). This means that a particular note value (for example, a quarter note or crotchet) is specified as the beat, and the marking indicates that a certain number of these beats must be played per minute. The greater the tempo, the larger the number of beats that must be played in a minute is, and, therefore, the faster a piece must be played. Mathematical tempo markings of this kind became increasingly popular during the first half of the 19th century, after the metronome had been invented by Johann Nepomuk Mälzel, although early metronomes were somewhat inconsistent. Beethoven was the first composer to use the metronome, and in 1817 he published metronomic indications for his (then) eight symphonies. Some of these markings are today contentious, such as those on his "Hammerklavier" Sonata and Ninth Symphony, seeming to many to be almost impossibly fast, as is also the case for many of the works of Schumann. With the advent of modern electronics, BPM became an extremely precise measure. Music sequencers use the BPM system to denote tempo. 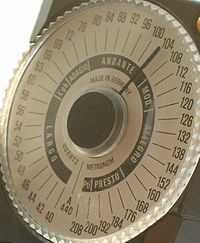 As an alternative to metronome markings, some 20th century composers (such as Béla Bartók and John Cage) would give the total execution time of a piece, from which the proper tempo can be roughly derived. Whether a music piece has a mathematical time indication or not, in classical music it is customary to describe the tempo of a piece by one or more words. Most of these words are Italian, because many of the most important composers of the 17th century were Italian, and this period was when tempo indications were first used extensively. Before the metronome, words were the only way to describe the tempo of a composition. Yet after the metronome's invention, these words continued to be used, often additionally indicating the mood of the piece, thus blurring the traditional distinction between tempo and mood indicators. For example, presto and allegro both indicate a speedy execution (presto being faster), but allegro also connotes joy (from its original meaning in Italian). Presto, on the other hand, indicates speed as such. Additional Italian words also indicate tempo and mood. For example, the "agitato" in the Allegro agitato of the last movement of George Gershwin's piano concerto in F has both a tempo indication (undoubtedly faster than a usual Allegro) and a mood indication ("agitated"). In some cases (quite often up to the end of the Baroque period), conventions governing musical composition were so strong that no tempo had to be indicated. For example, the first movement of Bach's Brandenburg Concerto No. 3 has no tempo or mood indication whatsoever. To provide movement names, publishers of recordings resort to ad hoc measures, for instance marking the Brandenburg movement "Allegro", "(Allegro)", "(Without indication)", and so on. In Renaissance music most music was understood to flow at a tempo defined by the tactus, roughly the rate of the human heartbeat. Which note value corresponded to the tactus was indicated by the mensural time signature. Often a particular musical form or genre implies its own tempo, so no further explanation is placed in the score. Thus musicians expect a minuet to be performed at a fairly stately tempo, slower than a Viennese waltz; a Perpetuum Mobile to be quite fast, and so on. Genres can be used to imply tempos; thus Ludwig van Beethoven wrote "In tempo d'un Menuetto" over the first movement of his Piano Sonata Op. 54, although that movement is not a minuet. Popular music charts use terms such as "bossa nova", "ballad", and "Latin rock" in much the same way. It is important to remember when interpreting these words that not only have tempos changed over historical time, and even in different places, but sometimes even the ordering of terms has changed. Thus a modern largo is slower than an adagio, but in the Baroque period it was faster. Beats per minute became common terminology in disco because of its usefulness to DJs, and remain important in the same genre and other dance music. In this context the beats measured are either crotchets (quarter notes) in the time signature (sometimes called down-beats, although the term is ambiguous), or drum beats (typically bass-drum or another functionally similar synthesized sound), whichever is more frequent. Higher BPM values are therefore achievable by increasing the number of drum beats, without increasing the tempo of the music. House music is faster around 120-128 bpm (from regular house music to UK Garage), and Jungle music generally ranges between 140-150 BPM (with some differences in older compositions). Psytrance is almost exclusively produced at 145 BPM, whereas Speedcore and Gabber music both frequently exceed 160 BPM, with an underlying crotchet tempo of around 150-220 BPM. More extreme BPMs are achievable at the same underlying tempo with very fast drum patterns, often expressed as drum rolls. Such compositions often exhibit a much slower underlying tempo, but may increase the BPM by adding additional percussive beats. Extreme music subgenres such as speedcore and cybergrind often strive to reach excessively high BPM rates. The use of extreme tempo was very common in the fast bebop jazz from the 1940s and 1950s. A common jazz tune such as "Cherokee" was often performed at quarter note equal to or sometimes exceeding 368 BPM. Some of Charlie Parker's famous tunes (Bebop, Sha Nuff, Donna Lee) have been performed at 380 BPM plus. John Coltrane's "Giant Steps" was performed at a BPM of quarter note equal to 374. Another example of extreme BPM is "Fascination MAXX" by 100-200-400. Beatmatching, a tool amongst DJs, concerns the speeding up or down of a record in order to match the BPM of a previous track so both can be seamlessly mixed. DJs often beatmatch the underlying tempos of recordings, rather than their strict BPM, particularly when dealing with high BPM tracks. A 240 BPM track, for example, will normally match the beat of a 120 BPM track without slowing down or speeding up, because both are likely to have an underlying tempo of 120 crotchets (quarter notes) per minute. Thus, some soul music (around 75-90 beats per minute) can be mixed well with a drum and bass beat (from 150-185 beats per minute). Normally, the pitch and BPM of a track are linked: spin a disc 10% faster and both pitch and tempo will be 10% higher. Software processing to change the pitch without changing the tempo, or vice-versa, is called time-stretching or pitch-shifting. While it works fairly well for small adjustments (± 20%), the result can be noisy and unmusical for larger changes. Measures per Minute (MPM) or bars per minute is another way to measure the speed of music: the number of measures in one minute. It is commonly used in ballroom dance music. The definitions of the Italian tempo markings mentioned in this section can be found in the Harvard Dictionary of Music and/or the online Italian-English dictionary, both of which are listed in Sources. All of these markings are based on a few root words. By adding an -issimo ending the word is amplified, by adding an -ino ending the word is diminished, and by adding an -etto ending the word is endeared. A piacere — the performer may use his own discretion with regard to tempo and rhythm; literally "at pleasure"
Note: Metronome markings are a guide only and depending on the time signature and the piece itself, these figures may not be appropriate in every circumstance. non troppo — not too much, e.g. allegro non troppo (or allegro ma non troppo) means "fast, but not too much"
Note: In addition to the common allegretto, composers freely apply Italian diminutive and superlative suffixes to various tempo indications: andantino, larghetto, adagietto, and larghissimo. Tranquillamente — adverb of tranquillo, "calmly"
While the base tempo indication (such as allegro) appears in large type above the staff, these adjustments typically appear below the staff or (in the case of keyboard instruments) in the middle of the grand staff. a tempo - returns to the base tempo after an adjustment (e.g. "ritardando ... a tempo" undoes the effect of the ritardando). Tempo primo or Tempo I - denotes an immediate return to the piece's original base tempo after a section in a different tempo (e.g. "Allegro ... Lento ... Moderato .... Tempo I" indicates a return to the Allegro). This indication often functions as a structural marker in pieces in binary form. These terms also indicate an immediate, not a gradual, tempo change. Although they are Italian, composers typically use them even if they have written their initial tempo marking in some other language. Although Italian has been the prevalent language for tempo markings throughout most of classical music history, many composers have written tempo indications in their own language. The definitions of the tempo markings mentioned in this section can be found in the Harvard Dictionary of Music and/or the online foreign language dictionaries which are listed in Sources. Au mouvement — play the (first or main) tempo. Erik Satie was known to write extense tempo (and character) markings by defining them in a poetical and literal way, as in his Gnossiennes . One of the first German composers to use tempo markings in his native language was Ludwig van Beethoven. The one using the most elaborate combined tempo and mood markings was probably Gustav Mahler. For example, the second movement of his Symphony No. 9 is marked Im Tempo eines gemächlichen Ländlers, etwas täppisch und sehr derb, indicating a slowish folk-dance–like movement, with some awkwardness and much vulgarity in the execution. Mahler would also sometimes combine German tempo markings with traditional Italian markings, as in the first movement of his sixth symphony, marked Allegro energico, ma non troppo. Heftig, aber markig (Energetically quick, but not too much. Violent, but vigorous). English indications, for example quickly, have also been used, by Benjamin Britten and Percy Grainger, among many others. In jazz and popular music charts, terms like "fast", "laid back", "steady rock", "medium", "medium-up", "ballad", and similar style indications may appear. Often, composers (or music publishers) will name movements of compositions after their tempo (and/or mood) marking. For instance the second movement of Samuel Barber's first String Quartet is an "Adagio". Sometimes the link between a musical composition with a "tempo" name and a separate movement of a composition is less clear. For instance Albinoni's Adagio, a 20th century creative "reconstruction" based on an incomplete manuscript. Some composers chose to include tempo indicators in the name of a separate composition, for instance Bartók in Allegro barbaro ("barbaric Allegro"), a single movement composition. When performers unintentionally speed up, they are said to rush. The similar term for unintentionally slowing down is drag. Musicians generally consider unintentional tempo drift undesirable, and these terms thus carry a negative connotation. Therefore neither rush nor drag (nor their equivalents in other languages) are often used as tempo indications in scores. Mahler is a notable exception. For example, he used schleppend (dragging) as part of a tempo indication in the first movement of his Symphony No. 1. ^ See "metronome" entry in Apel (1969), p. 523. ^ Apel (1969), p. 42; for the literal translation see the online Italian-English dictionary at WordReference.com. ^ Apel (1969), p. 505. ^ Apel (1969), p. 834. ^ Apel (1969), p. 61. ^ Online Italian-English dictionary at WordReference.com. ^ Apel (1969), p. 112. ^ Apel (1969), p. 334. ^ Apel (1969), p. 520. ^ Apel (1969), p. 537. ^ Apel (1969), p. 680. ^ Apel (1969), p. 683. ^ Apel (1969), p. 763. ^ "Brillante" entry in Sadie (2001). ^ Italian translation, WordReferece.com; German, Apel (1969). Epstein, David (1995). Shaping Time: Music, the Brain, and Performance. New York: Schirmer Books. ISBN 0028733207. Marty, Jean-Pierre (1988). The tempo indications of Mozart. New Haven: Yale University Press. ISBN 0300038526. Sadie, Stanley; John Tyrrell, eds. (2001). The New Grove Dictionary of Music and Musicians, 2nd edition. NewYork: Grove's Dictionaries. ISBN 1561592390. This article is licensed under the GNU Free Documentation License. It uses material from the Wikipedia article "Tempo". Allthough most Wikipedia articles provide accurate information accuracy can not be guaranteed.